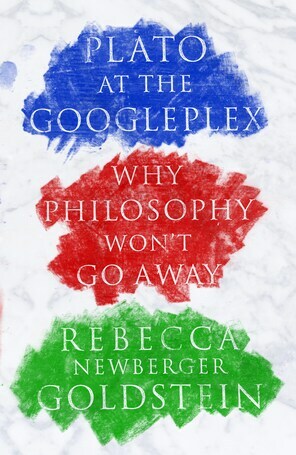 (Pantheon/Pantheon) – ”Plato at the Googleplex: Why Philosophy Won’t Go Away” by Rebecca Goldstein. In case you’re wondering, the Googleplex is the corporate headquarters of Google. Rebecca Goldstein’s newly published book is about the continuing relevance of philosophy and philosophical inquiry, specifically Platonic philosophical inquiry, to the lives we lead in the 21st Century. Her claim, as signified by the book’s subtitle, “Why Philosophy Won’t Go Away,” is that philosophy and Platonic inquiry not only remain relevant to our lives today, but have also made progress and advanced our understanding of ourselves since the time of Plato. I’m only about fifty pages into the book and am looking forward not only to gobs of food for thought, but also an entertaining tour de force. This entry was posted in Books, Non-Fiction Notes and tagged Books, Michael Dirda, Non-Fiction, Philosophy, Plato, Plato at the Googleplex, Rebecca Goldstein. Bookmark the permalink.